Former Naval pilot Tuck Pendleton joins a research program that studies miniaturization. During a test, he is shrunken to microscopic size and is supposed to be injected into a rabbit, but when the facility is attacked by those looking to steal the technology, the program's head scientist flees and injects Tuck into the body of a random Safeway employee named Jack Putter. Now, Tuck must find a way to get out of Jack before his pod runs out of oxygen, all while Putter is being pursued by the tech thieves. There are a lot of movies that deal with shrinking people down to a tiny size in the name of science. Usually, the shrinking makes someone the size of a rodent or even as small as an ant. Only a couple of films deal with shrinking people to microscopic levels. "Fantastic Voyage" was the first to do this in 1966, but the technology back then didn't create a truly believable view of the internal structure of a body. In 1987, technology had finally caught up, and filmmakers were able to fully realize that vision with the action comedy "Innerspace." The film is directed by Joe Dante, who is known for movies like "Gremlins," "Explorers," and "Matinee." It stars Dennis Quaid as Lt. Tuck Pendleton, a disgraced Navy pilot who gave up his commission to join a private research program trying to perfect miniaturization. Tuck has agreed to be a guinea pig and is soon to be shrunken to microscopic size and injected into a rabbit. Halfway through the experiment, the research facility is attacked and head scientist Ozzy, played by John Hora, attempts to save their research by going on the run. After getting shot, he injects Tuck into the first person he sees, which happens to be a neurotic grocery store checker named Jack Putter, played by Martin Short. Now, the tech thieves are after Putter, and Tuck only has a limited amount time to get out of Jack before he runs out of oxygen. At its core, "Innerspace" is a pretty simple and formulaic action comedy. The hero is captured a couple of times followed shortly by daring escapes all leading to a final showdown between hero and villain. Luckily, this film has a lot going for it. Dennis Quaid is a very charming protagonist and offers a strong performance even though he is mostly limited to sitting behind a console of the pod he pilots. Martin Short is very funny and gets to do his usual comedic schtick, though to a slightly more subdued degree than he has in the past. The two actors work really well off each other and often have great exchanges of dialogue, especially in the first few minutes that Putter learns Tuck is inside him. Once Meg Ryan gets involved, all hell breaks loose. She plays Tuck's ex-girlfriend Lydia, and eventually, she has to interact with Putter as Tuck, even though Putter is starting to feel for Lydia himself. The real star of this film though is the visual effects. The visual effects artists do a fantastic job in creating the internal world of Jack Putter's body. From the red blood cells to the eyes, from the eardrums all the way to his stomach complete with bubbling acid, it all looks fantastic. "Innerspace" wound up taking home a much-deserved Academy Award for best visual effects. 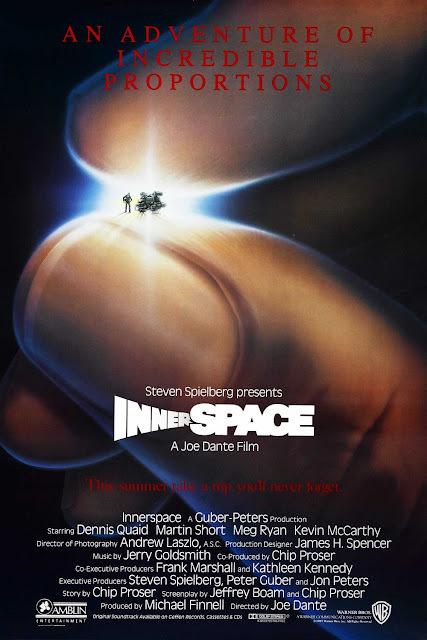 In the end, "Innerspace" is a simple yet enjoyable movie that unlike others in the genre has visuals (many of which are practical) that have held up very well even 30 years later. Its charming leads and wacky plot make this an entertaining watch.